These are the steps to load a Godot project in Xcode. This allows you to build and deploy to an iOS device, build a release for the App Store, and do everything else you can normally do with Xcode. You must export for iOS from a computer running macOS with Xcode installed. 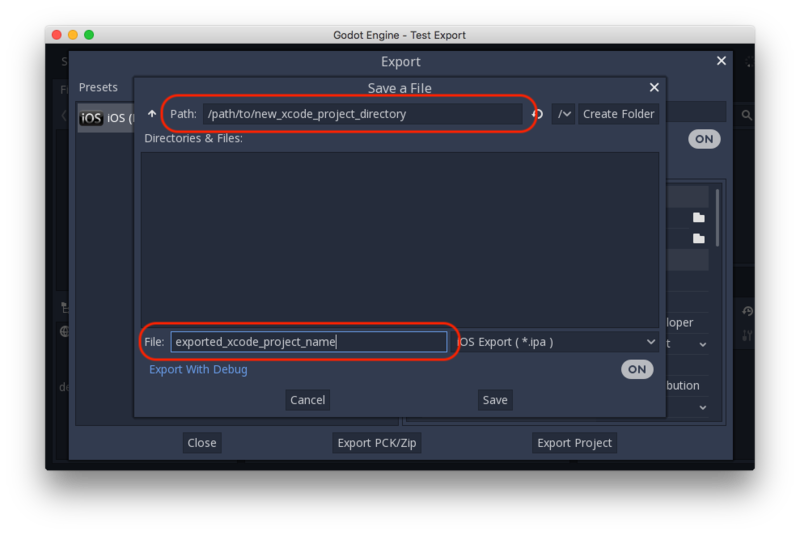 In the Godot editor, open the Export window from the Project menu. When the Export window opens, click Add.. and select iOS. Path is an empty folder that will contain the exported Xcode project files. File will be the name of the Xcode project and several project specific files and directories. This tutorial uses exported_xcode_project_name, but you will use your project’s name. When you see exported_xcode_project_name in the following steps, replace it with the name you used instead. Opening exported_xcode_project_name.xcodeproj lets you build and deploy like any other iOS app. The above method creates an exported project that you can build for release, but you have to re-export every time you make a change in Godot. While developing, you can speed this process up by linking your Godot project files directly into your app. exported_xcode_project_name is the name of the exported iOS application (as above). godot_project_to_export is the name of the Godot project. Start from an exported iOS project (follow the steps above). In Finder, drag the Godot project folder into the Xcode file browser. 3. In the dialog, make sure Create folder references is selected. This means you will be able to continue to edit your Godot project in its current location. 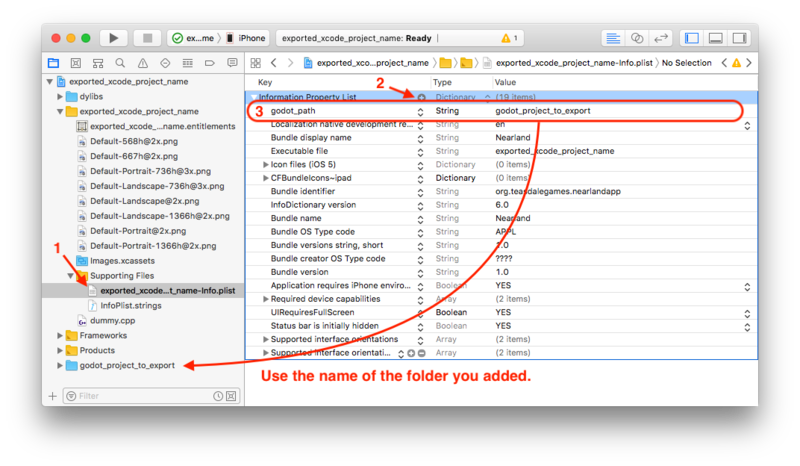 See the godot_project_to_export folder in the Xcode file browser. Delete exported_xcode_project_name.pck from the Xcode project. That’s it! You can now edit your project in the Godot editor and build it in Xcode when you want to run it on a device. Special iOS services can be used in Godot. Check out the Services for iOS page.